When the chairperson of the prestigious Knapper-Warburton Literary Prize dies in suspicious circumstances, Robert Amiss wastes no time in summoning Baroness ‘Jack’ Troutbeck to step into the breach. In deplorable taste and wickedly funny, this, the tenth in the Robert Amiss series, will consolidate the author’s reputation for scurrilous humour. Pubilshed in the UK by Harper Collins. Published in the US by Poisoned Pen Press. Available as a hardback and paperback on Amazon. Read my article Making fun of Academics on Mystery Readers International. Marvellously entertaining and iconoclastic series of satires on the British establishment. Ruth Dudley Edwards is a crime writer whom we should treasure – sharp, intelligent and gloriously politically incorrect. 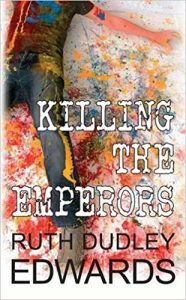 [Ruth Dudley Edwards] writes ebullient novels filled with entertaining eccentrics. 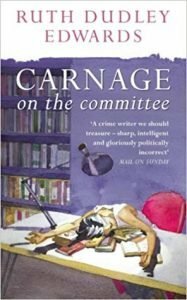 Carnage on the Committee is satire at its best… Witty, irrelevant, and down right funny… With her robust language, on the spot assessment of the current situation, this is one of the funniest books that I have read in a long time. Dudley Edwards is an equal opportunities satirist. She’s rude to every persuasion.